← Bad triple dare day.. This funny little clock was a Christmas present for Mom. I got it for her. Yes, it was a funny little clock that played the tune “The Way We Were.” I know that some members of the family were irritated by the tune that went off every hour. I heard the stories about how it should be thrown in the trash but I know they were only joking, even though they seemed unaware of how insensitive it seemed to me. I saw the love and focus she put into this little clock. 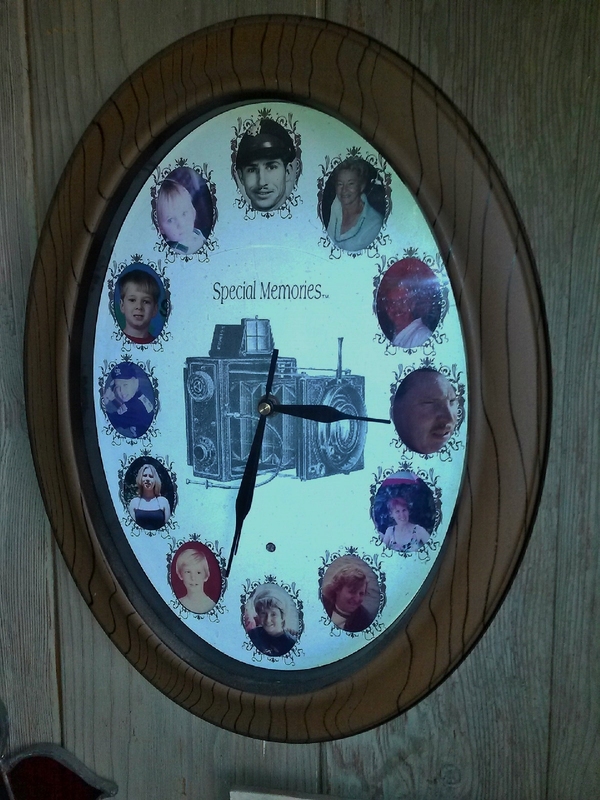 Each hour of the clock had a little place for a picture; just enough for the family. It has twelve places for our immediate family. Starting at the top at twelve O’clock then going right; first is Dad, Mom, Steve, Greg, Sallie, Gus and me. Then the grandchildren with Steve Jr., Renee’, Howard, Johnfred and little blued eyed Shyane. Just perfect… but of course mom was good at these types of things. She always had a little dance in her step when the tune played. This is how I remember seeing her. It was her clock and pictures of her family. Sometimes it is the funny little things that mean so much. This entry was posted in "In the beginning there was a void except for the written word." The Avengers (Band) and tagged clock, family, Mom, Oral Tradition, postaday, punk rock music. Bookmark the permalink.